Why is Top Gun Day May 13th? We intended for Top Gun Day to be observed on the day the movie was released, which was May 16th, 1986. 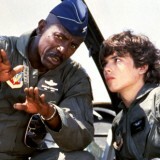 Problem is, that’s Iron Eagle Day. I know, I know, that blows–the ugly step child gets the real day. Actually, that’s not true, and as far as I know there is no Iron Eagle Day. The real story is we screwed up when creating a few graphics and by the time we caught the error the word was already out. It turns out that choosing the 13th was serendipitous for a few reasons. First, since Top Gun Day is so HUGE we would overshadow any chatter about the movie itself! Second, since the dates are so close it means Top Gun Day can be enjoyed a few days straight. Lastly, well, I could tell you, but then I’d have to kill you. We really are cowboys. Hemlock anyone?